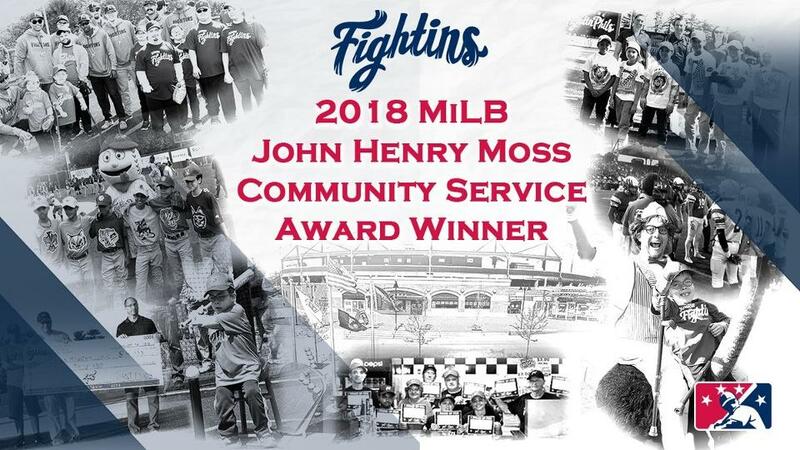 ST. PETERSBURG, Fla. -- Minor League Baseball today announced the Reading Fightin Phils the recipient of the sixth annual John Henry Moss Community Service Award. The award was created in 2013 by Minor League Baseball in honor of the late John Henry Moss, who founded what would become the South Atlantic League in 1959 and headed the circuit until 2007. The Fightin Phils will receive their award at the Baseball Winter Meetings Banquet on Sunday, Dec. 9, at the Mandalay Bay Resort and Casino in Las Vegas. "The Reading Fightin Phils and Baseballtown Charities are honored to accept this award on behalf of our tremendous sponsors, volunteers, R-Phils front office, game staff, and our fans - the Citizens of Baseballtown," said Reading General Manager Scott Hunsicker. "Our goal is to help more kids learn life lessons through the game of baseball and softball. Greater Reading has so many wonderful organizations and passionate people, working to make our community a better place for all, and we are honored and humbled, to work with so many worthwhile causes." "The Reading Fightin Phils' commitment to their community and the greater Reading area is quite impressive," said Minor League Baseball President & CEO Pat O'Conner. "Through Baseballtown Charities and their other philanthropic and charitable efforts, the Fightin Phils embody the characteristics of a community leader. On behalf of Minor League Baseball, I commend them for their good work and congratulate them on this honor." In addition to the award, Minor League Baseball Charities will make a $2,500 donation on behalf of the Fightin Phils to Baseballtown Charities. Baseballtown Charities, the Fightin Phils' community service program, has long played a large role in providing opportunities for children in Reading to play baseball. Twelve years ago, Baseballtown Charities raised more than $1 million to build Gordon Hoodak Stadium at Lauer's Park, which has provided over 1,000 boys and girls who may not have otherwise had an opportunity to participate in baseball, a chance to be part of a team and learn the game. In 2018, the team launched the Baseballtown Dream League, providing boys and girls with special needs the opportunity to participate in the game of baseball during an eight-week season. Baseballtown Charities raised $1.2 million for the league, the facility and equipment. In 2018, the Fightin Phils provided 850 volunteers for over 3,500 hours of volunteer work in the Reading area and used First Energy Stadium as the host venue for several charitable efforts, including Reading's Diamonds & Dreams dinner on the field, which raised over $70,000 for Baseballtown Charities, and the Autism Society Walk which raised over $50,000 for the Autism Society of Berk's County. The annual Humane Society Walk raised over $100,000 for the Humane Pennsylvania organization. The Baseballtown Gridiron Classic series, a slate of seven high school football games played at FirstEnergy Stadium raised more than $40,000 for the participating high schools, while Jalen Mills of the Philadelphia Eagles held a charity softball game that raised over $30,000 for the National Youth Foundation. The Fightin Phils make an extra effort to serve the youth of their community by providing educational programs. The Squires Program is a mentorship program for elementary-aged children in the Reading area. Students can apply to become a squire, attend several meetings each year with the Fightins staff and have the opportunity to become an intern with the club in the future. A school assembly program is hosted by the Fightin Phils at FirstEnergy Stadium, in conjunction with elementary and middle schools throughout Eastern and Central Pennsylvania, providing tips to more than 14,000 students per year on how to handle stress during state-wide testing, complete with an appearance during educational activities from the Fightins' mascot, Screwball. Also included is a season-long gameday reading program called Ready-Set-Read, which features players and other volunteers reading books to children at 50 home games with the goal of providing support to struggling young readers and empowering parents to help their children develop their literary skills.